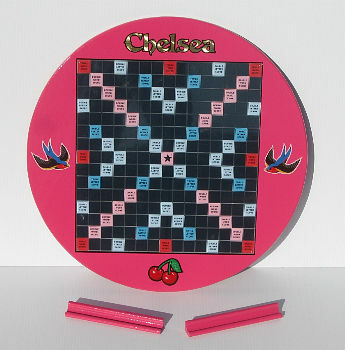 WELCOME TO THE SOURCE FOR CUSTOMIZED BOARDS FOR USE IN SCRABBLE® GAMES. Each board is a unique, one-of-a-kind hand-crafted item...the perfect gift for the person who has everything! Whether you're a competitive tournament player or a casual "living room" player, I can create a unique personalized game board for your Scrabble® enjoyment! 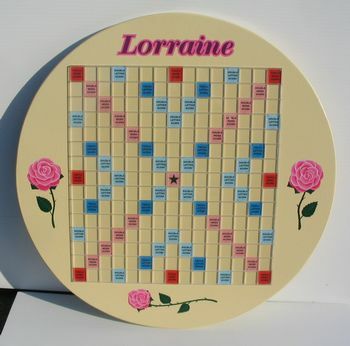 All boards feature a plastic grid from an actual Deluxe Scrabble® game, with raised squares to prevent the tiles from moving. The grid is mounted to a round painted wood board, and decorated with your choice of lettering, artwork, abstract designs, etc. As a professional lettering/sign artist with 40 years experience, I can design something special and unique for any customer! The board is mounted to a sturdy "Lazy Susan" turntable for ease of turning and comes with matching wooden racks. Please visit the Price List/Contact page for information on how to order. I am proud to have provided boards for customers in Mexico, Canada, England, Ireland, Scotland, Japan, New Zealand, Australia and Brunei Darussalam (!) ...as well as the good ol' USA! VISIT MY LINKS PAGE FOR DEALERS OF TILES, STUDY PROGRAMS, ETC. This site is hosted for free by FreeWebs.com. Click here to get your own free website.